1. A statement faux fur coat: I have learned that having a few statement coats in your closet in addition to your go-to basics really is ideal when it comes to colder weather. Since there is a good chance that you will be wearing a coat everyday for the next four-five months, having a few that feel fun instead of just warm will make getting ready to brave the cold a little more stylish. I think I'm at the point to where I have a rainbow collection of faux fur (...oops), but this Topshop daisy one sure did catch my attention. 2. A beanie / hat: This is the area that I need to improve on. Hats make such a difference when it comes to not having the heat escape your body. I for one, don't think that beanies look the best on me, but I saw this chunky H&M style this past weekend (after my ears were freezing) and am determined to start trying to pull them off even if it's just a warmth issue. 3. Fun mittens / gloves: If you're anything like me, keeping the same pair of mittens over the course of the winter season (forget the year) is quite the struggle. Like socks, I always end up with one of them and have misplaced the mate. Because of this, I try to have a few different styles always stocked up and in different places from my book bag, my car, and my room for whenever the cold hits. Inexpensive styles like these cute Old Navy ones keep me smiling even when I'm cold. 4. Over-the-Knee boots: Boots are one of the best winter investments in my opinion. I have quite the collection of ankle boots in my shoe closet, but have yet to add a pair of over-the-knee ones. The Stuart Weitzman 50/50 is one that is on my 'winter wish list' year after year, but these Zara ones come in pretty close, too. How fabulous is the patent cap toe part?! 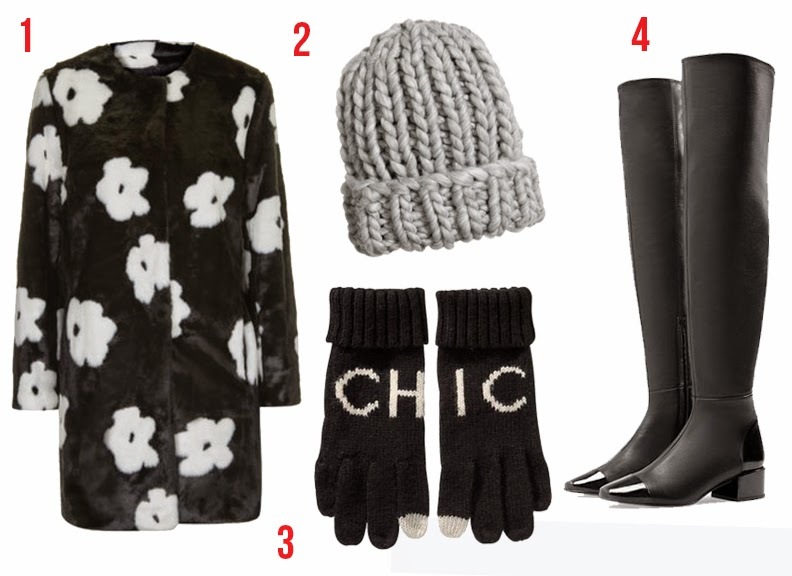 What are your must-haves for the Winter season? I'm also a huge fan of infinity scarves. They make all the difference in my opinion. Hi and welcome to 85 Dresses! I'm Leah, a recent Syracuse grad where I studied fashion design and public communication. I was born and raised in Houston, Texas and dream of ending up in New York City working with a fashion design team Enjoy!.